Here is some interesting news from OLA cabs for all Chennai riders. 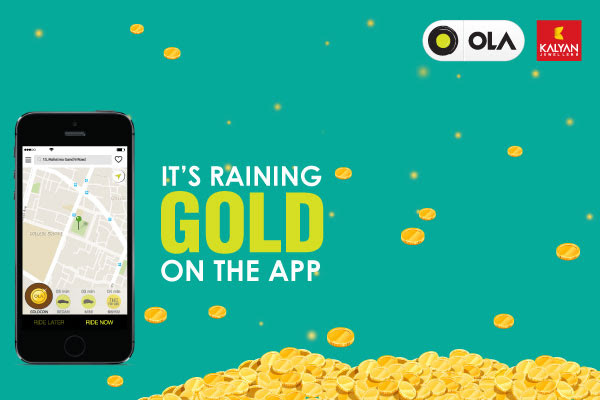 OLA is celebrating this Dhanteras with a free gold coin offer in Chennai. How to avail this free gold coin offer from OLA Chennai? 1. Open the OLA app on 9th November between 11 AM to 2 PM. 2. Select the icon 'GOLDCOIN'. 3. Hit RIDE NOW and Confirm. If your booking is success, OLA will come to your doorstep with a gift card and drive you to the nearest Kalyan Jewellers store where you can redeem the card for your Gold coin. As a mark of reverence, you have to pay Rs.11/- at the store. 1. This OLA Free Gold Coin from Kalyan Jewellers offer is available only in Chennai. 2. OLA Cabs with free gold coin offer are subject to availability. 4. Once the OLA cab arrives at your doorstep, please leave immediately for your destination. 5. This is a one-way ride only. 6. For queries about gold coin, contact Kalyan Jewellers.